If you are interested in Indian classical music, I am sure you have a nice time spending your time with me at my home page. I am a musicologist in the Hindustani tradition of Indian classical music. I have been a disciple of Pt.Seshadri 'Gawai' since 1965. I am a member of the Karnataka Sangeetha Nritya Academy - a state government cultural affairs body. I work with "Mico", an engineering company in India. More about my career and my profession in music as we go along. I am from the 'Gwalior Gharana' of Hindustani music. In this style, emphasis is laid on rendering the lyrics of the 'bandish' (composition) with clarity, while demonstrating the subtelities of the raag. Gwalior is considered to be the oldest among all the gharanas. "guru brahma, gurur vishNu, guru dEvo mahESwaraha, guru sAkshat para brahma, tasmai Sri guravE namaha". As I was mentioning, I was initiated into the beautiful world of hindustani classical music by my guru Sangeetha Kalarathna Pandit R.V. 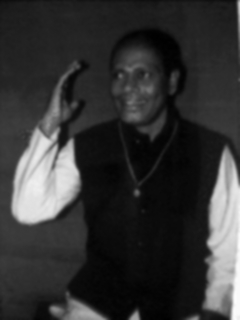 Seshadri 'Gawai'. He is the disciple of the great Puttaraja 'Gawai', who is an acclaimed master of both the Hindustani and Carnatic styles. Shri. Puttaraja 'Gawai's name is taken with great reverence in the music world. He leads a saintly life in his ashram with hundreds of his students. His being born blind never proved a handicap - even at his current age of over 90 years !! And, Puttaraja Gawai is a chosen disciple of the doyen and the earliest of the masters - Panchakshari 'Gawai'. Thank you for visiting my home page. If you are interested in knowing further about Hindustani classical music, please join me as I take you through a tour of the wonderland called Music.